2018 has been a landmark year in the political development of Malaysia, given the surprising result of GE14 which, for the first time since independence, saw a democratic political transition. At some point in the new year the editorial board hope to put together a special issue exploring the social, political and regional consequences of the events of 2018. 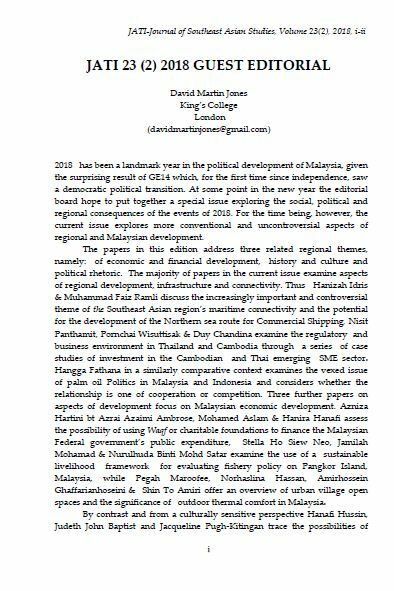 For the time being, however, the current issue explores more conventional and uncontroversial aspects of regional and Malaysian development. The papers in this edition address three related regional themes, namely: of economic and financial development, history and culture and political rhetoric. The majority of papers in the current issue examine aspects of regional development, infrastructure and connectivity. Thus Hanizah Idris & Muhammad Faiz Ramli discuss the increasingly important and controversial theme of the Southeast Asian region’s maritime connectivity and the potential for the development of the Northern sea route for Commercial Shipping, Nisit Panthamit, Pornchai Wisuttisak & Duy Chandina examine the regulatory and business environment in Thailand and Cambodia through a series of case studies of investment in the Cambodian and Thai emerging SME sector. Hangga Fathana in a similarly comparative context examines the vexed issue of palm oil Politics in Malaysia and Indonesia and considers whether the relationship is one of cooperation or competition. Three further papers on aspects of development focus on Malaysian economic development. Azniza Hartini bt Azrai Azaimi Ambrose, Mohamed Aslam & Hanira Hanafi assess the possibility of using Waqf or charitable foundations to finance the Malaysian Federal government’s public expenditure, Stella Ho Siew Neo, Jamilah Mohamad & Nurulhuda Binti Mohd Satar examine the use of a sustainable livelihood framework for evaluating fishery policy on Pangkor Island, Malaysia, while Pegah Maroofee, Norhaslina Hassan, Amirhossein Ghaffarianhoseini & Shin To Amiri offer an overview of urban village open spaces and the significance of outdoor thermal comfort in Malaysia. By contrast and from a culturally sensitive perspective Hanafi Hussin, Judeth John Baptist and Jacqueline Pugh-Kitingan trace the possibilities of enriching the soundscape and dancescape of Sabah through Sumazau whilst Rachel Chan Suet Kay considers the possibility of ‘Breaking windows’ to examine Malaysian Manga as a dramaturgy of everyday Malay realities. From a more historical and political perspective that continues to shape regional behavior Chong Wu Ling & Sivachandralingam Sundara Raja assess the beginnings of konfrontasi examining the first major military incursions in Sarawak, Sabah and Peninsular Malaysia during the Indonesia-Malaysia Confrontation. To examine this confrontation they examine the struggle from the perspective of Malaysian English language newspapers. Finally Nimfa G. Dimaculangan & Ma. Cezanne D. Dimaculangan use critical discourse analysis to assess the different rhetorical notions of political hegemony in Benigno Aquino’s and Rudolfo Duterte ’s initial state of the nation addresses. These various contributions extend and develop our awareness of the cultural, political and economic mosaic that is contemporary South East Asia.